The Rudston Monolith: A 3D Model of the tallest standing stone in Britain. The Rudston Monolith is the tallest standing stone in Britain, at a height of a little over 7.6m. The monolith a hard grey sandstone or gritstone slab was most likely put up during the late Neolithic or Early Bronze Age between 2500BC and 1600BC. The monolith later provided a focus for the construction of the Church of All Saints, Rudston, and most likely provided the place name which is derived from ‘Rood Stone’ or cross stone. The stone which has been described by antiquaries as being embedded in the ground as deep as it is high, occupies a commanding position in a landscape in which it was surrounded by four intersecting Cursus monuments, enigmatic monuments, the best known of which is at Stonehenge, which may have served as ritual walkways. 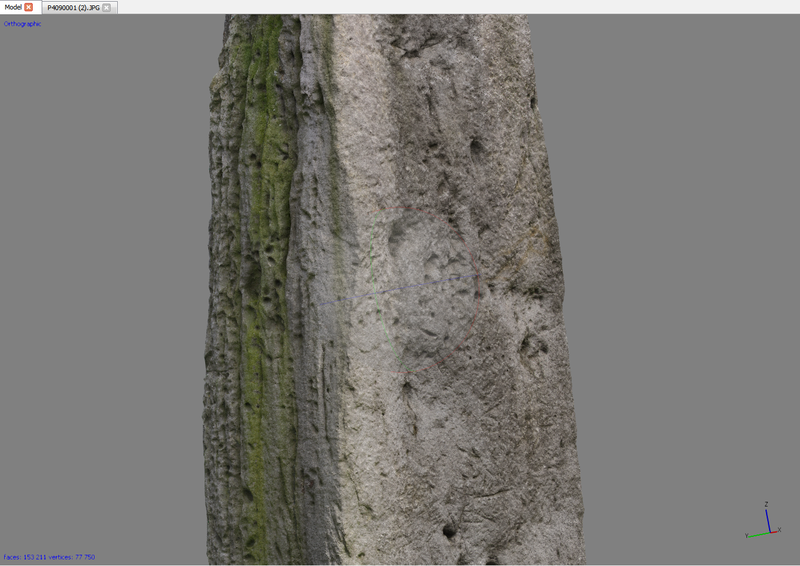 The size of the stone is such that it is difficult to examine in detail from the ground, but is a perfect candidate for 3D modelling by digital photogrammetry, using digital photography and Structure from Motion software. In order to gain photographs with sufficient detail, overlap and viewpoint to successfully create the model a 6m. long photo-pole was used with a wireless remote control system with the live view viewfinder information transmitted to a combined viewer and trigger used on the ground. With a team of three people, one to hold the pole, one to direct positioning of the pole and a third to confirm focus and fire the camera 377 photographs were taken in 11 circuits around the stone. Times recorded with the images show that the photography took one and a half hours. Initial computer processing of the images to generate a test model using Agisoft Photoscan Pro took about four hours. In order to generate an measurable scale model the lower 2.5 metres of the model was photographed twice once with and once without a 2m photographic scale. 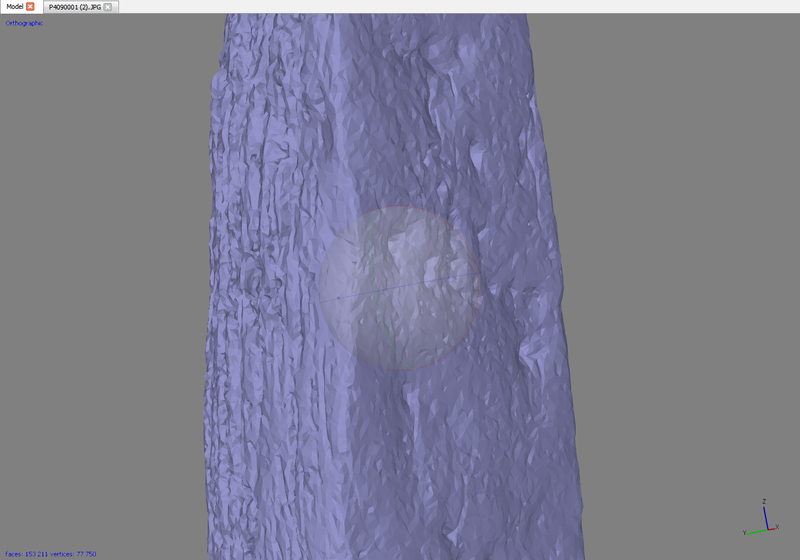 The processing of the final model which took place over a number of evenings included creating two models of the base of the stone, matching and combining these and then once the model had been scaled the scale pole was isolated and the duplicate stone modelling data removed to leave correctly scaled model incorporating the scale pole. The scaled result, the precision of which may be less than the millimetre precision possible using this method of modelling since only a single feature was used for scaling. 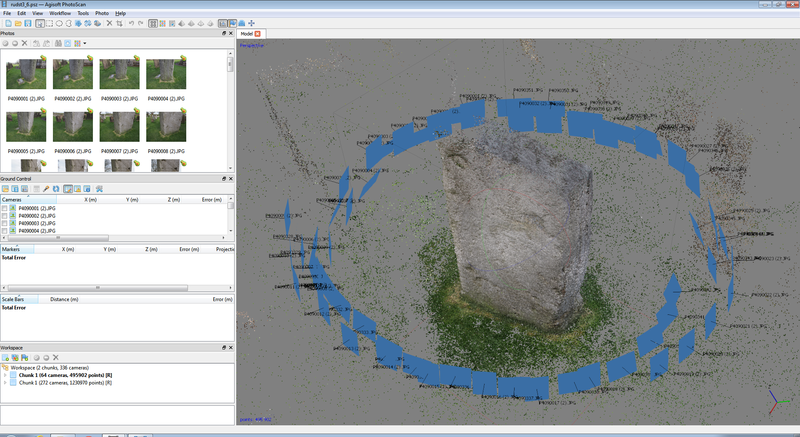 The resulting model incorporates a meshed or triangulated surface which derives from a point cloud of measured 3D points calculated from the photographs and a collection of images which incorporate the photographic detail or texture covering each of the meshed triangles in the model. The final archive model incorporated more than 3 million 3D points and 1.5 million triangles and the textures derived from 337 photographs. A 3D model of this size requires a powerful computer with a large amount of memory and a high speed internet connection if it is to be viewed remotely. Once the full resolution model has been built decimation is used to reduce the number of points/triangles and generate a model which can be more easily distributed. Decimation is designed to eliminate touching triangles which are on same plane retaining triangles which most closely describe undulating surfaces and thus still reveal the shape of the object but in a much smaller file. 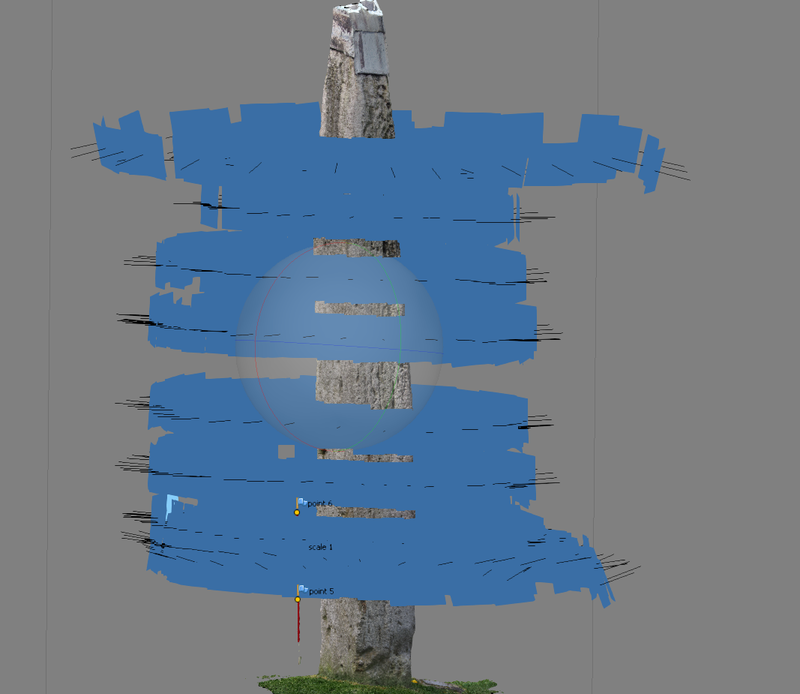 In the case of the Rudston Monolith a model reduced to 153,000 triangles or faces still provides an accurate model but in a manageable file. The resulting model is saved in two formats a measurable 3D model in a 3D pdf file suitable for downloadable distribution on the web as well as archiving in an established archive format and an object model which can be viewed live on the internet. Thanks are due to Woody Musgrove and Georgina Ritchie for assistance in gathering the photographs.